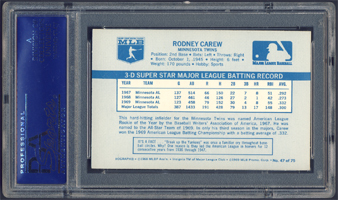 An infielder with Minnesota and California, Rod Carew was one of baseball's premier single hitters, slapping 3,053 hits and registering a lifetime .328 batting average. He topped .300 in 15 consecutive seasons on his way to seven batting titles, a mark surpassed only by Ty Cobb's 12 batting titles. 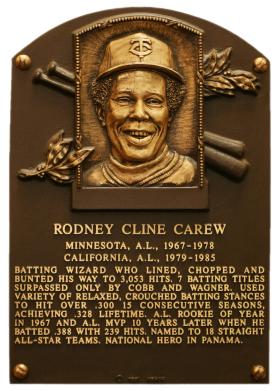 Carew's 1975 MVP year consisted of a .388 batting average, 239 hits, 16 triples, 128 runs scored, 100 RBI, and an on-base percentage of .415. Comments: The first portrait was a 1981 Topps PSA 9, won on eBay in February, 2001. 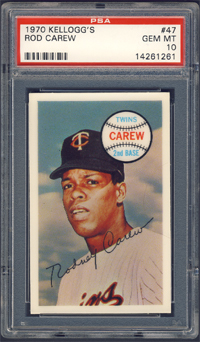 In October, 2007 I swapped it out for a 1970 Kellogg's PSA 9 with another auction win. 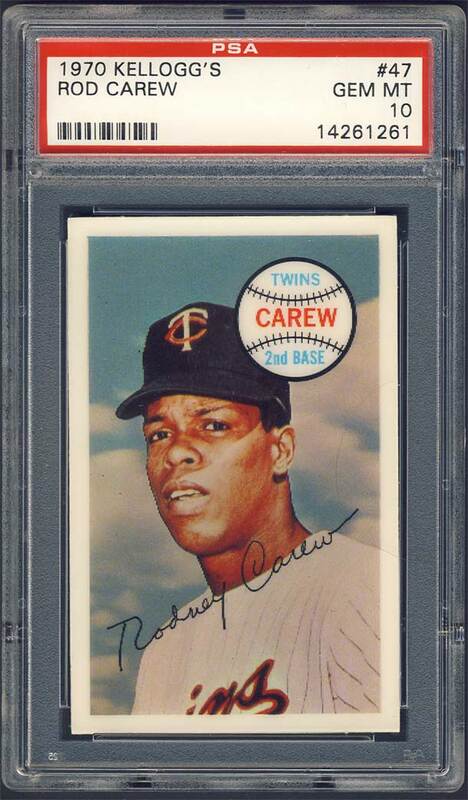 Nearly a year later, in August, 2008, I upgraded to this PSA 10 after winning an eBay auction from seller Jerry Romanko. Description: For 14 years in the 1970s and early 1980s, the Kellogg's cereal company provided Topps with virtually the only meaningful national competition in the baseball card market. Kellogg's kicked off its baseball card program in 1970 with a 75-player set of simulated 3-D cards. Single cards were available in selected brands of the company's cereal, while a mail-in programe offered complete sets. The 3-D effect was achieved by the sandwiching of a clear color photo between a purposely blurred stadium background scene and a layer of ribbed plastic. 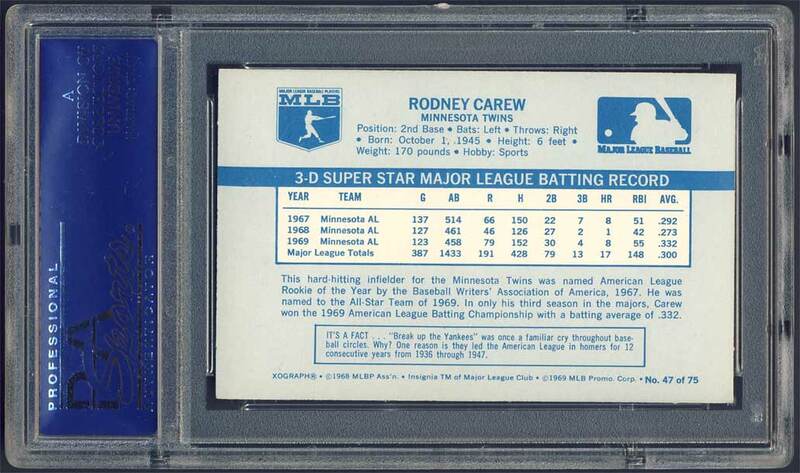 The relatively narrow dimension of the card, 2-1/4" X 3-1/2" and the nature of the plastic overlay seem to conspire to cause the cards to curl, often cracking, the plastic layer, if not stored properly.